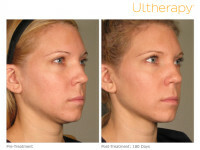 Ultherapy is the only FDA approved non-surgical method for skin tightening, lifting, and toning. This treatment is extremely effective at treating what is commonly referred to as turkey neck. Turkey neck is a rather unflattering term used to describe the wrinkling and sagging of the skin of the neck that commonly occurs as people age. The natural loss of skin elasticity combined with a loss of muscle tone in the neck causes the turkey neck and loose jowls appearance. Until a few years ago, the only way to resolve a turkey neck was to endure painful cosmetic surgery with a long recovery time. Today, non-invasive Ultherapy treatment allows patients to avoid the expense, downtime, and the risks of undergoing surgical procedures under general anesthesia. Gradually over 3-6 months time, Ultherapy treatments lift and tighten the skin on the neck, effectively eliminating the natural sagging that sometimes occurs. Ultherapy for décolletage before and after. Although Ultherapy is commonly used to lift the skin of the neck, chin, and brow, this effective non-surgical anti-aging treatment produces stunning results when used on other areas of the body as well. Ultherapy treatment is now being used more frequently to reverse the signs of aging in areas all over the body. New popular treatment areas include the abs, elbows, knees, décolletage, and any other areas that could benefit from skin tightening. Ultherapy uses focused ultrasound to stimulate the growth of new collagen. After treatment, results can be seen in just a few weeks and continue to improve for three to six months. There is absolutely no downtime or bruising, making Ultherapy treatment ideal for visible areas of the body. Chevy Chase Cosmetic Center is pleased to offer PRO-NOX to our Ultherapy patients. PRO-NOX is a patient-controlled analgesic system that delivers 50% oxygen and 50% nitrous oxide to immediately relieve discomfort. The PRO-NOX system is proven to be safe and effective when used during Ultherapy treatment. The patient self-regulates their gas intake by inhaling through a disposable mouthpiece. The effects of PRO-NOX wears away quickly, allowing patients to return to their normal activities soon after treatment. Use of PRO-NOX allows Chevy Chase Cosmetic Center to provide a comfortable and stress free experience for our Ultherapy patients. PRO-NOX is ideal for patients that require longer treatments or those treating sensitive areas. In addition, use of PRO-NOX allows our physicians to treat the areas more aggressively. PRO-NOX alleviates discomfort caused by Ultherapy treatment and relieves patient anxiety. This makes it possible for more people to take advantage of the benefits of this effective skin tightening treatment. Chevy Chase Cosmetic Center is a full service dermatology practice specializing in non-surgical cosmetic treatments and general dermatology. Our board-certified dermatology team is well prepared to help you determine the best treatment for your needs. We have extensive experience utilizing advanced techniques with Ultherapy and other anti-aging treatments. Our new PRO-NOX system enables our team to deliver specialized care, while alleviating the discomfort and anxiety some of our patients experience. Contact us at 240-482-2555 to schedule a complimentary consultation to learn more about Ultherapy and the PRO-NOX system.